From mowing the grass and cleaning windows to making deliveries at hotels and hospitals, even child and elder care, robots of all shapes and sizes are doing things humans have been doing for years. These types of machines can also do things humans cannot. "It can work all day, 24 hours a day, and it doesn’t get emotional. It’s always welcoming with a smile," said Simon Wang of the Beijing Canny Unisboro Technology Co. Ltd. He said the machines' ability to work around the clock makes them cheaper than hiring a human employee. "It will be the cheapest member of your team for sure," said Steve Cousins of Savioke, a company that makes hotel and hospital delivery robots for rent around the world. 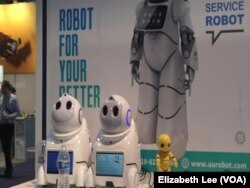 A Chinese-made, Mandarin-speaking robot named UU is already working in the service industry. He dances, tells jokes and provides information. This is a California-based robot. It is customizable, segmented and modular. It is weather-proof and can be used in disaster relief, construction, agriculture, mining, etc. "For example, it can be a shopping center, hotel, restaurant, some convention centers, galleries as a guide…," Wang said, adding the UU robot is already working in China "in a hospital setting, in a clinic, to diagnose problems and to answer some medical questions." Adapting technology to perform humans' work is nothing new. "Go back to ploughs or go back to tractors, those are the beginning of adding technology to work to make workers more productive. A spreadsheet is not smarter than you, but it is faster at calculations. It’s just different, and so when you put a spreadsheet in an accountant’s hands, you make that accountant much, much more productive. The same thing with robots," Cousins said. Robots are getting smarter. A demonstration at the Consumer Electronics Show last month showed a robot playing the English word game Scrabble against a human opponent, and winning. "Its (the robot’s) main point is not to replace people’s jobs. It is to help people do really complicated work," said Hu Ji Ping of the Industrial Technology Research Institute. In addition to doing complicated work, robots are also doing dull, dirty and dangerous work. A robot called RoboMantis can do unsavory work, so a person does not have to be in those situations. "Confined spaces, refinery tank cleaning, things like that where you can really take advantage of a robot that can go in and work for hours on end without endangering a human in those situations," said Chris Thayer of California-based Motiv Robotics that makes the RoboMantis. 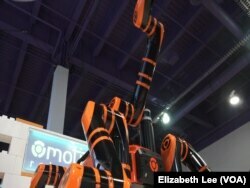 Robots can also do work that is so repetitive, such as in agriculture, that no one wants to do it, Thayer said. "Xiaoyou" are the two robots on the left. "Xiaoben" is the yellow robot on the right. All are created by the China-based BEIJING CANNY UNISBORO TECHNOLOGY CO., LTD.
"…picking, maintenance, a lot of things of that kind, caring for the plants themselves in a certain very specific way that needs to be done, and they aren't getting those workers in regardless of seasonal, not seasonal, whatever it may be. It’s just a labor shortage," Thayer said. "I guess there are people who do just put a plug in a hole one after the other, all day long. Those people have already been replaced by robots, and those were pretty horrible jobs anyway," said Cousins. Wang said bosses love robots, but they are not a threat to people, yet. "Robots will free people up to do more specialized work that can only be learned by a human’s intellect," Wang said. "I don’t think a robot will completely replace a human’s mind currently or in the next 10 years, I haven't found this kind of danger." The consensus among technologists: Robots are here to assist and not to replace. However, humans may have to continue to learn more specialized skills to stay ahead of what a robot can do.